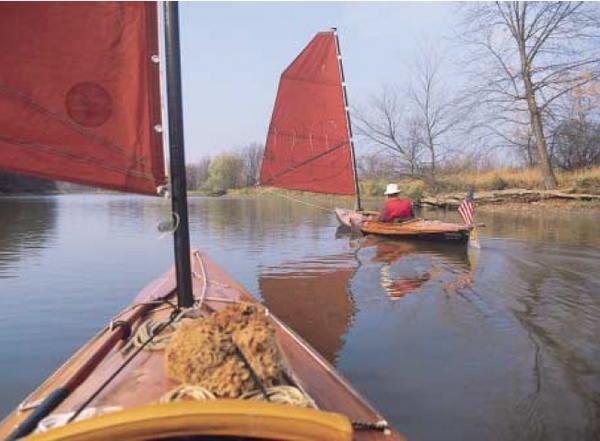 As a life long sailor, I have always had some mystical attraction to the canoe. As a young man, I read the exploits of my French Canadian ancestors who plied our beautiful Great Lakes for over two centuries in their birchbark canoes in pursuit of the fur trade. More recently, I followed the adventures of Verlen Kruger as he traveled by kayak from Alaska to South America. I fantasized that someday I could embark on a similar adventure that would follow some of the historical routes of the “voyageurs” on the Great Lakes. This view changed on August 26, 1998, when I attended a small boat symposium near Saginaw, Michigan. On a small man-made lake next to the expressway, I watched an impressive sailing canoe go through its paces. The wind was light, perhaps 6-8 knots, and this canoe was moving smartly for what seemed an unusually small amount of sail area. What was most intriguing was how well it was performing to weather, easily tacking within 90° to me the measure of a true sailboat. Its other attractive feature was that it wasn’t an open canoe nor a confining kayak, but a decked canoe with an open cockpit and molded seat. It showed comfort and seaworthiness could be mutually compatible goals. 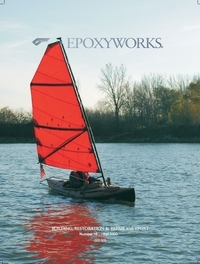 I soon traveled down to Horton’s Boat Works, trying to buy his sailing canoe, Puffin. Hugh wasn’t about to sell his beloved Puffin, but he did offer to build me a new sailing canoe which would incorporate his latest thinking in what Hugh calls the 50/50 cruising canoe. I took delivery of Serendipity last summer. Even on the first sail she proved to be everything I had hoped for. She paddled and sailed beautifully. But the best part was that she was without question the most comfortable boat I had ever been in a greater priority in one’s 60’s than in one’s 20’s! This was a craft I could enjoy well into my senior years.